Spot on Chris. I bought a Skyleader Courier set brand new in 1981, and it had rate switches, which were an extra cost option...... I don't recall any servo reversing on it though. The answer - for me - has to be the present, or if you like the current decade. I have a fabulous choice of stick and tissue FF plans from pre-War to the present which I can download and build from balsa ordered online (and a far greater range of other materials and equipment that a single model shop could ever carry), I can put together a 2-stroke classic pattern ship from a modern laser-cut kit, or stay old-school and build a trad Chris Foss aerobatic for 4-stroke or a similar era slope-soarer, or very quickly assemble an ARTF and bung in my own RX, plus I can benefit from very high-tech materials and extraordinary electronics and TX programming by way of a current DLG design or moulded slope-soarer. On top of all this, there are superb resources and knowledge-bases online, enabling learning and communication that simply didn't exist when I was converting a Keil Kraft SE5A (from Henry J Nicholls on the Holloway Road) to Telco CO2... surprised it actually flew! THat reminds me of my first club, The REgents Park MFC. 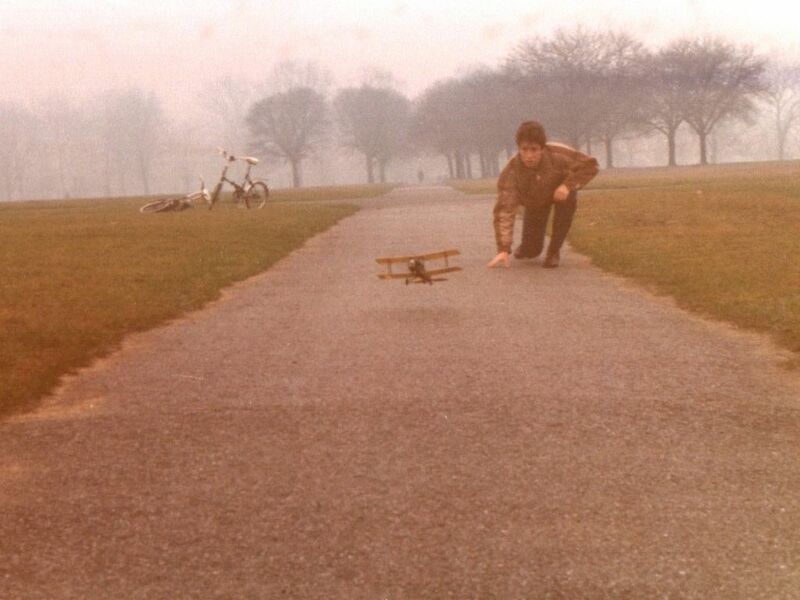 We used to fly on Hampstead Heath and Epsom Downs. I was only with them for a few months. I wonder if any of them are still around. NOW. Radio, Engines, motors have never be cheaper and you are spoilt for choice. It it sad that one can no longer browse in your LMS unless you are lucky enough to live near the few remaining shops but their demise just reflects the retail trend in general. On the other hand online it is a global shop with infinite variety of choice, availability and price. If you are a traditionalist (I am) then thousands of plans are available online to build that model you always hankered after but couldn't afford or simply didn't have the time, back in the day. Perhaps that is not so much nostalgia as an opportunity to fly something different to one of the modern offerings but using modern reliable and cheap radio control. And now we have the choice of using a traditional two stroke, four stroke or electric conversion. No, we have never had it so good, to coin a phrase! For me I would say that now is the best era for modelling. OK more rules and regs etc but modelling is far cheaper than it was in the 60s & early 70s (My first full set of propo radio was c£180.00 in 1970 ish - that equates to about £2700 now. A single servo was c£25.00 An OS61 FSR was about £75.00 which was about a weeks wages at the time. 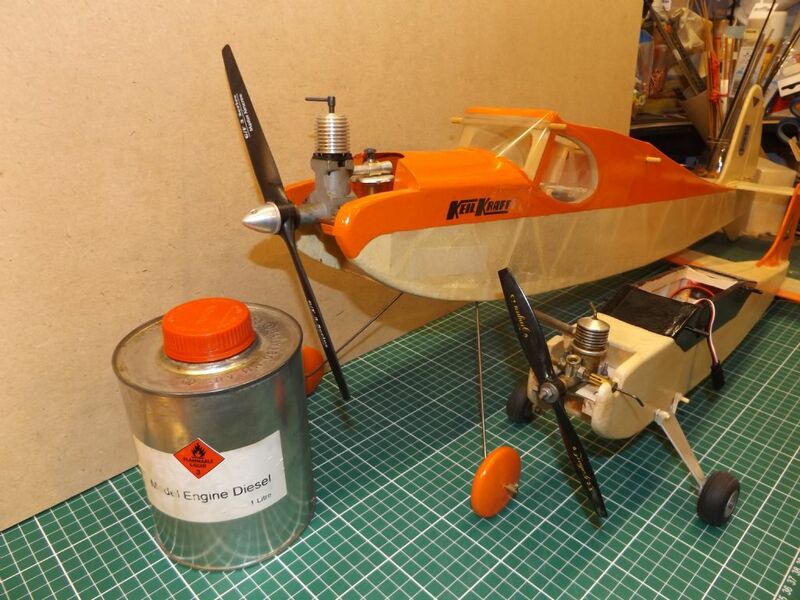 Now If you want to build you can but if you want to get a model into the air quickly you can - at a price that would have been unbelievable 30 - 40 years ago. Radio is incredibly reliable and cheap, engines and electric motors too. Good servos are available for around a tenner or less. In real terms what has increased in price are plans, building materials, and kits. You have never had it so good! Were the diesel engines more reliable than the 2 and 4 stroke glows,and the petrol engines? Well SONNY, some modellers had great success using diesel engines, and still do although some seemed unable to master having two adjustables ( fuel mixture and compression) to deal with. Yes, they're certainly reliable in the hands of someone who knows diesels. They can also swing a much larger propeller than a glow engine. Diesel engines are fewer these days Sonny, with just a handful of manufacturers now offering them. PAW, Laser, MVVS and a few others now produce them. The smaller capacity diesels are still popular with free flighters though. Davis Diesel in the US produce conversion kits for quite a number of glow two strokes. I agree with FlyinBrian in terms of reliability; accessibility and cost. The downside is pressure on flying sites; demise of local model shops and the reduction in numbers especially of the younger generation. This is a significant risk for the future of our sport. As good as it would be to have a steady influx of younger members Robert, there are sometimes new flyers in their 30's and beyond whom enter the hobby thankfully. Not all whom try it stay, but there seems little we are able to do about that......... Some I know have unfortunately had less than pleasant experiences as club members, and have moved on to form their own small groups. Like people, clubs can differ. I started trying to start my dads Mills 1.3 diesel back in the early 1960's when I was about 8 years old, once you have smelt the Ether rthere is no looking back, still have a PAW .5cc in the Mini Tyro & a replica Mills 1.3 in the enlarged Keilcraft Eaglet. As good as it would be to have a steady influx of younger members Robert, there are sometimes new flyers in their 30's and beyond whom enter the hobby thankfully. Not all whom try it stay, but there seems little we are able to do about that......... Some I know have unfortunately had less than pleasant experiences as club members. Like people, clubs can differ. Our club peaked at about 65 members a few years ago, but now we have 40 members fully paid up for this year. We have a new web site, are on the BMFA club finder. have adequate instructors, a fantastic flying site, a warm mobile home complete with "shop", have interesting monthly meetings and go out of our way to make sure the members come first, at a safe and well organised site. We were hoping for an influx of newbies after the recent CH4 model series. So far (and I know its early in the year), we have attracted two complete novices and four ex-members. We have no "youngsters" at all. We are very positive about the future and believe we are as proactive as we possibly can be. No doubt about it, the hobby is changing rapidly!! Sounds very positive and quite encouraging Simon. Some clubs are struggling now, and are actively advertising for members. The nearest club to me ( I'm not a member) had 100+ members about 20 years ago, and has now dwindled to about 25, or so I'm told. Out of the 75 odd members whom are now missing, about 10 or a dozen have passed away, with perhaps 4 or 5 having moved out of the area on retirement. The rest have either left the hobby for health reasons, or have moved on to form other groups/clubs. I fall into this category. If you PM me, I'll give you all the gen.
Can I have three decades please, all consecutive? I’d go for 1950 till 1980. This was a time when I was first a member of the Croydon club (not the Croydon Airport one, which flies RC and didn’t exist till around 1970), which was an enthusiastically competitive free-flight club with seven consecutive annual wins of the Plugge Cup at a time when a hundred or so other clubs were competing for it. There were four model shops within five miles of home, and half a dozen model flyers living less than a mile away. If you wanted diesel fuel you went along to Boots and, at the age of fourteen, bought a pint of ether, four ounces of amyl nitrate, went into the garden shed and mixed it with some paraffin and Castrol R. Nobody died. We managed to cross roads when there was a gap in the traffic too, instead of pressing some button and then waiting while the gaps went past till a beeper went and stopped cars that weren’t in sight when we arrived. But I digress. What made it such an enjoyable period for the sport was that there were several free-flight venues within easy reach of London at various times - Epsom, Fairlop, Chobham and Bassingbourn, with a contest almost every weekend at one or another. The big appeal of free-flight was, and still is, that the sole aim of competitions is duration; a stopwatch shows how successful you are, so it's pureely objective. It’s man versus the elements, rather than the opinions of a panel of judges. We competed against ourselves as much as with others, and making subtle adjustments to the trim or the structure (which of course we had built and probably designed ourselves) would improve the performance for the next contest. I suspect that the stamina of a younger body helped too; I’d certainly think twice now about a 400 mile round trip drive to a contest in Yorkshire, but we seemed to take it in our stride then. Irvine did produce some diesels gangster. As did Super Tigre and Enya at one time. Glows probably won over diesels because of ease of operation for beginners to the hobby. Some competition classes remain steadfastly with diesel though. It's good to see ED diesels back on sale via Weston UK. Available with balanced crankshaft at extra cost. It's also possible to obtain a Laser 80 diesel, but it's request only engine, and Jon builds them to special order only. PAW are probably the most popular UK produced diesel just now. Do let me know if you ever see a Saito two stroke though. They're extremely rare, and I've seen just one in the last 30 odd years being used at Old Warden in a vintage model.